The Horizon T901 treadmill is a new design that deserves a second look. Not only is it packed with features such as a power incline, advanced cushioning, and a large walking/running surface, you can get it in different colors to match your workout room. The Horizon T901 treadmill features two large red LED feedback windows as well as an additional communication window for easy navigation. It comes with seven workout programs designed by personal trainers, 3 of which are open-ended and the other 4 are saved workouts. UPDATE: The Horizon T901 treadmill has been discontinued and is no longer available. 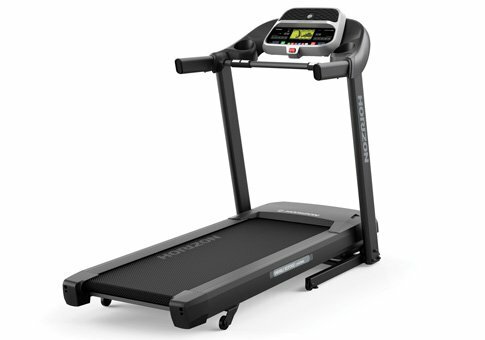 Check out the latest Horizon treadmills to find a comparable model. 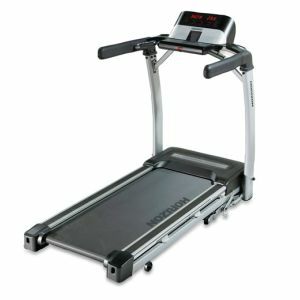 Experts are impressed by what Horizon has done with their treadmills at this price level. Along with a quiet and tough 2.25 continuous horse power motor, the Horizon T901 has a 1.6 mm thick belt, a roomy walking area, extra cushioning on the deck, and a good warranty. As an added bonus, the trim on the frame and dash is available in four different colors (choose from electronic black, cobalt, slate, or salsa red), which is an unusual and attractive selling point. While there aren’t many treadmill reviews posted online on this new model, the first customers are quite satisfied with the overall quality of the machine. The Horizon T901 a no-frills basic model that focuses on a premier workout experience rather than trying to entertain you with a TV in the console or a lot of buttons to play with. This isn’t a good treadmill for avid runners, but it is a good choice for a person who wants to walk or jog daily or several times a week. 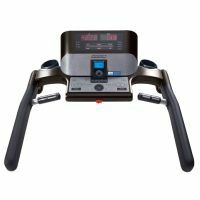 Horizon has improved the quality in a few areas in their budget line of treadmills, and has aggressively priced them to capture more market share from competitors. That improvement and lower price can be found in this impressive machine, which offers solid performance, comfortable cushioning, and daily reliability. The Horizon T901 treadmill gets strong marks for quality and good value priced at $999. It rates a Good Buy.